Sawadee ka. That’s Thai for hello. Why the random language lesson on a Monday morning? Because Curious Citizen has touched down in Thailand! Yes, that’s right, I’m writing this from the beautiful kingdom, in the heart of Southeast Asia, fully immersed in a new culture, doing what I love most (traveling and eating mostly), and making new discoveries every day. If you’re wondering how I got here, well the story began at the end of February when life threw a curve ball my way. As my favourite saying goes, if you want to make God laugh, tell him your plans, and I kept that in mind when my life was suddenly thrown into chaos. I needed to hit pause and reset, so I hopped on a plane, flew halfway around the world, and ended up here. Thailand has been incredible so far. The people, the landscape, the climate. Everything is so different from what I know back home, and I guess that’s kind of the point. When we leave our comfort zone and see the world through a traveller’s eyes, where even the simplest tasks require pointed concentration, we become mindful in a way that we don’t often get to be when surrounded by the familiar. But enough philosophizing. Here’s what you really need to know about Thailand. It’s H-O-T hot. I imagine this is what a turkey must feel like, roasting in an oven. Think of the hottest conditions you’ve ever experienced and then crank it up another ten degrees and you’ll have some idea of what I mean. (Note: this really only applies if you’re from a cold climate like me.) Granted, April is the hottest month of the year here – a month when even the locals comment on how hot it is, but still. 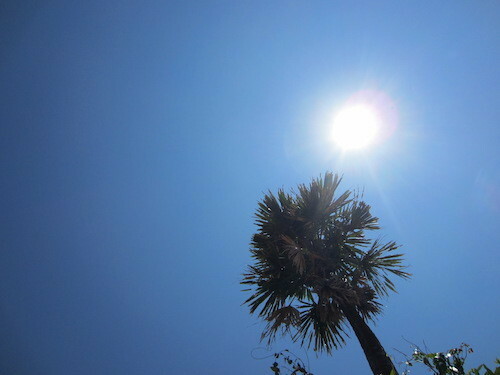 There is not a moment’s reprieve from the heat. When the breeze blows, it blows hot air. When the sun sets, it’s still 28 degrees. You make peace with the fact that, morning to night, you will be sweating. You’ll sweat when you sit. You’ll sweat standing still. Or “glow” as I like to say. I glow, I don’t sweat. It makes me sound more like a lady and less like the sweaty mess that I am. What a spin. The toilet situation may differ slightly from what you’re used to at home. There are a lot of places with “Western” toilets (surprisingly airports tend to have the best bathrooms), but there are an equal amount of “Thai” toilets, which are the good old fashioned keyhole in the ground, requiring you to squat in order to relieve yourself. Thankfully, with all the years I spent at camp, squatting on canoe trips, I can handle any bathroom thrown at me. Thailand is one of the most polluted places I’ve seen (bear in mind, my travels before this have been limited mainly to Westernized countries). I’m not talking about smog, but about actual garbage in the streets, in the parks, in the mountains, on the beach, everywhere. Judging by the piles of garbage you see, it doesn’t seem like the people are particularly concerned about littering. 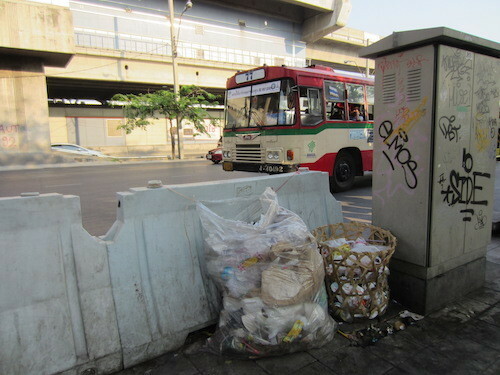 With that in mind, if you’re visiting Thailand then heed this advice: if you find a garbage, use it. You’ll be waiting quite some time before you see one again. Every bridge I’ve encountered here could benefit from a once over by a structural engineer. I send up a prayer to the universe every time I cross one, hoping that I’ll make it to the other side. So far, so good. I’ve seen scaffolding made from bamboo that looks like it could blow over with a strong sneeze. I’ve seen walkways without railings protecting people from a steep drop into the sea. The public bus doesn’t even come to a full stop when letting passengers on or off. They just slow to a roll and hope for the best. And the electrical wires in Thailand. WTF. They’re like a jumble of black spaghetti, hovering over sidewalks and streets. Before I came, many friends offered insights from their time in Thailand, and the one thing that everyone agreed on was that the food here is amazing, and the best food is to be found from street vendors. I’ve heeded that advice and it hasn’t steered me wrong. I’ve tasted curries and soups, salads and exotic teas. I haven’t tasted a fried cricket yet (I would have never made it on Survivor). 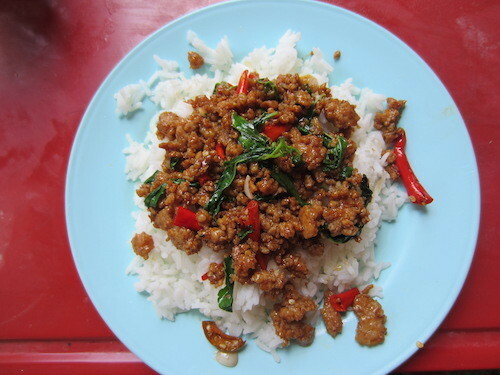 Currently, my favourite dish is Pad Kra Prao (spicy stir-fried pork with basil and rice), ideally topped with an egg. It’s about 30 baht on the street (the equivalent of just over $1 CAD) and it’s consistently delicious. I’m also eating my weight in grapefruit, which you can find from roadside fruit carts or in grocery stores or mini-marts, and is served sectioned and pith-free. 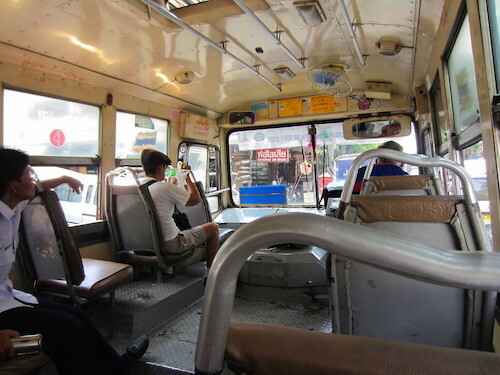 Most Thai people speak a little bit of English. Some speak a lot. Others, none at all. For the most part you can get by with English, but it’s always nice to learn a few words to show respect to the locals. So far, I’ve learned hello (sawadee ka), thank you (khob khun ka), very delicious (aroy maak), and how to count to ten. For someone who likes to eat and be friendly, this collection of phrases is serving me quite well. 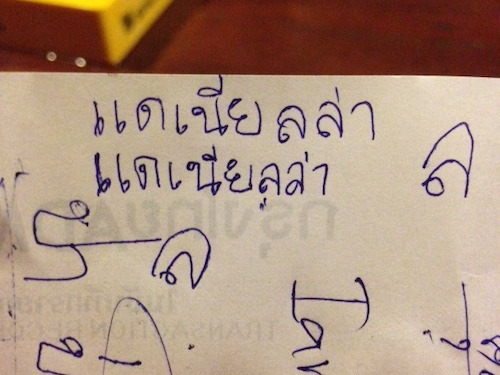 Reading or writing Thai seems an insurmountable challenge (and not one that I’ll be able to undertake on this visit), but my amazing guide Pui did show me how to write my name. Hers is the beautiful writing on top, and mine is the chicken scratch down below. It’s a work in progress.